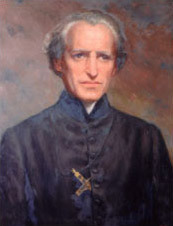 Basile Antoine-Marie Moreau, born at Laigne-en-Belin, near Le Mans, France, on February 11, 1799, founded the Congregation of Holy Cross. Basile Moreau saw a visible image of the Holy Family in this Congregation of Holy Cross which he had conceived as an Association of religious men and women working together on equal footing for the building of the reign of God. He intended that this Congregation, composed at its origins of three distinct Societies, namely, Sisters, Priests, and Brothers, be an apostolic institute. As Father Moreau stated in one of his letters, he envisioned that: "Holy Cross will grow like a mighty tree and constantly shoot forth new limbs and new branches which will be nourished by the same sap and endowed with the same life."